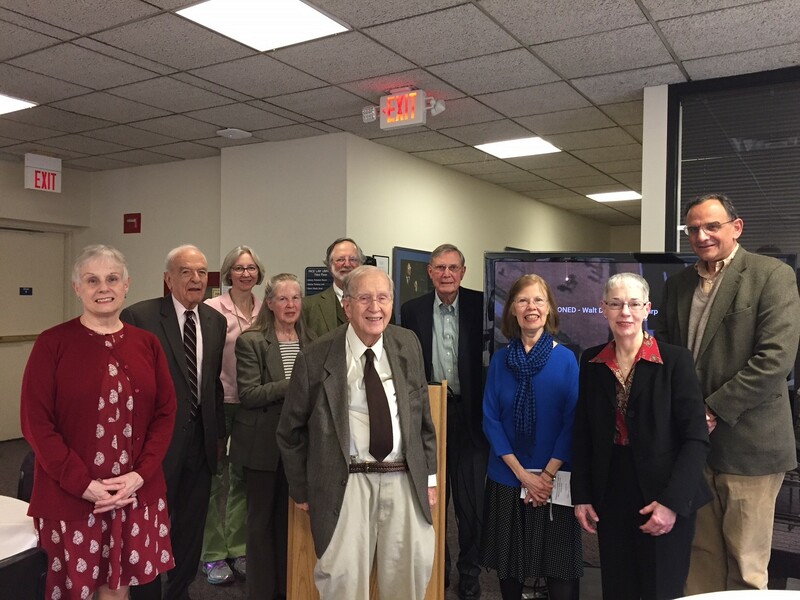 The Law Library hosted a reception in honor of Chauncey Olinger on April 12, 2018. Mr. Olinger donated a rare and unique research archive to the Environmental Law Archives at the Elisabeth Haub School of Law. His archive tells the story of defeating the Super Sonic Transport plan, which was to have been an American version of the ill-fated French/UK Concorde SST. Law Library Director and Professor of Law Marie S. Newman, Dean Emeritus Richard Ottinger, University Professor on the Environment and Gilbert & Sarah Kerlin Distinguished Professor of Environmental Law Emeritus Nicholas Robinson, and Mr. Olinger made remarks and presented the deed of gift to Gail Whittemore, Special Collections Librarian. A video of the ghost jet runway in the Everglades was presented. The legacy of this battle lives on, in today’s campaigns to end greenhouse gas emissions. Congratulations to Deborah Heller, Environmental Law Librarian, who received a grant from the American Association of Law Libraries (AALL) to attend the 2018 annual conference in Baltimore this July. Congratulations to Alyson Carney (left), Interlibrary Loan and Public Services Coordinator, who received an Outstanding Contribution Award at the 2017 Employee Recognition Awards ceremony. This award is presented to individuals whose commitment to the values and goals of the Strategic Plan have enhanced the University’s learning and working environment, and who demonstrate excellence and continuous innovation, independent thinking, diversity, professionalism and the highest standards. Alyson was nominated by Cynthia Pittson, Head of Reference Services. The following Library staff members received service awards at the 2017 Employee Recognition Awards ceremony: Vicky Gannon, Head of Circulation Services (30 years); Shumei Han, Cataloging Assistant (15 years); Gail Whittemore, Special Collections Librarian (15 years). Congratulations to Professor Marie Newman, a winner of the 2016 GreenPace Award. Prof. Newman was nominated by Vicky Gannon, Reference Librarian & Head of Circulation and Alice Pidgeon, Head of Technical Services, for her work on the Bottles to Books program. Throughout the Gerber Glass Law Center, recycle cans labeled Bottles for Books are available for students to donate their empty bottles and cans. Marie collects the recyclable bottles and cans and brings them to the recycling facilities on her own time. All the money collected goes to the Triffin Fund for the purchase of additional environmental books, DVD’s, journals, and databases. Since August 2014, Marie has recycled enough bottles and cans to raise approximately $500 dollars for the Triffin Fund. At .05 a bottle, that equals 10,000 bottles and cans that are not in a landfill. The GreenPace Award recognizes faculty, staff and students (individuals, departments and organizations within the Pace community) who develop innovative programs and services that assist Pace in meeting its commitment to sustainable practices. Errol Adams, Pace Law Library Electronic Services Librarian, was elected member-at-large to the Executive Board of the Black Caucus of the American Association of Law Libraries (BCAALL). Errol’s article Technology (Social Media) and Our Users: An Evolving Relationship was published in the 2014/2015 issue of CARALL Communications, a publication of the Caribbean Association of Law Libraries. His article appears on page 33. Congratulations, Errol. Errol Adams, Pace Law Library Electronic Services Librarian, was awarded the Experienced Librarian grant by the Computing Services Special Interest Section of the American Association of Law Libraries (AALL). This grant is intended to provide financial assistance to librarians who have a demonstrated commitment to the law library profession, especially those who are directly involved in providing technology support of any kind within law libraries. The grant covers registration costs for the 2016 AALL Annual Meeting to be held in Chicago this summer. Congratulations, Errol. Alyssa Rosen, Pace Law Library Environmental Law Librarian, and Errol Adams, Pace Law Library Electronic Services Librarian, were awarded AALL Annual Meeting Grants. These grants, awarded to members of the American Association of Law Libraries, fund attendance at the 2016 AALL annual meeting in Chicago in July. Congratulations, Alyssa and Errol. The following Library staff members were recognized at the November 2015 Employee Recognition Ceremony, Sunny Hlewicki, Assistant to the Director of the Law Library (30 years of service); Maria Cuccurullo, Technical Services Assistant, Cynthia Pittson, Head of Reference Services, Michael Weston, Evening Circulation Coordinator, and Wen-Xin Yao, Technical Services Assistant (each with 15 years of service); Pamela Harcharan, Collection Maintenance Coordinator (10 years of service). Congratulations to all!